Not many might be aware that a Chinese entity called the 718th Research Institute is the world’s third-largest manufacturer of industrial gases such as nitrogen trifluoride or NF3 and tungsten hexafluoride or WF6. These gases are used widely in industries like semiconductors and solar energy. Semiconductors are key to many high-tech industries. They are used extensively in computing, communication, information storage and processing, electronic counter measurements and even in upgrades of military weapons. They also play a significant role in sustaining economic growth and in national security. The institute supplies its products to domestic companies such as Semiconductor Manufacturing International Corporation, as well as exports them to the United States, Japan, France, Germany and Singapore. Among its prominent clients are Intel, Toshiba and Samsung. To reach the stage where the global NF3 and WF6 market pinnacle appears within grasp, the Hebei-based 718th Research Institute, a subsidiary of China Shipping Industry Corporation, had to toil for decades — more than five decades, to be precise. “We’ve over 50 years’ experience in producing gases from hydrogen, oxygen, toxic and hazardous gases. We’ve been working on special gases for over four decades,” said Li Junhua, head of the 718th Research Institute. The journey will likely get tougher going forward, as the State-owned special gases manufacturer is seeking to expand its business globally. Throughout its journey so far, the institute notched up several creditable achievements. For instance, it helped China to overcome dependency on NF3 imports. It has spent the past five decades developing special gases for commercial and military use in spite of the fact that the market has been dominated by international companies. Thanks to its persistent efforts and perseverance, the institute is now able to serve both domestic and export markets for NF3 and WF6. Industrial gases are used as basic raw material in the production of integrated circuits, semiconductors, optic fiber, solar power batteries and many other high-tech products. With the global electronics industry growing rapidly in recent decades, demand for special gases such as NF3 has soared. So has the price of imported gas, to $300 per kilogram in the year 2000. China alone used 2.5-billion-yuan ($390 million) worth of special gas in the semiconductor market and spent 2.2 billion yuan for special gas in the panel display market in 2016. China consumed 1,150 metric tons of NF3 in 2010, and sees growth of 20 percent annually. “With the deepening integration between military and civilian industries, the institute has successfully developed special gases with high purity. It also has been able to apply its technology for mass production, filling a gap in the domestic market. This has helped lower the costs to one-tenth of past levels,” said Guo Jianzeng, deputy head of the institute. The annual production capacity of the institute’s manufacturing plant for NF3 was 300 tons when it began mass production in 2016. Ever since, the capacity has grown by leaps and bounds. The current NF3 annual capacity is 9,000 tons while that for WF6 is 1,300 tons. To further expand its production capacity and diversify its product portfolio of special gases, the institute has firmed up a structured plan. Under the first phase which began last April, the institute set up a special gases manufacturing plant at Feixiang on the outskirts of Handan, Hebei province, at a cost of about 3.2 billion yuan. 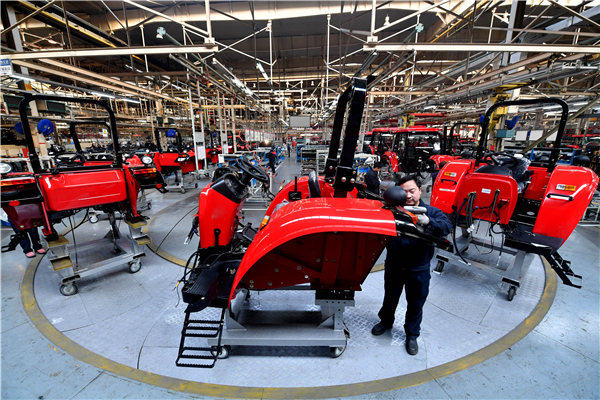 In less than a year, the new manufacturing plant was built with over 5,000 machines and 39 buildings, covering 100,000 square meters. The institute expects to increase the annual production capacity of NF3 and WF6 to 12,000 tons and 2,000 tons, respectively, by 2020. The combined production value at those levels would be 4.5 billion yuan. According to LEK Consulting, the industrial gases segment will see double-digit growth, and sales revenue is expected to reach 135 billion yuan this year. The institute’s revenue in 2020 is expected to reach 6.4 billion yuan, a leap frog jump from 94 million yuan in 2000. Given this backdrop, domestic companies should enhance their competitive edge to reduce dependence on imports, a report from LEK Consulting stated. Most Chinese manufacturers of industrial gases are not competitive enough against their foreign counterparts, it said. The domestic companies need to further enhance their research and development of technology, lower costs and optimize their services to compete with foreign companies, the report said.